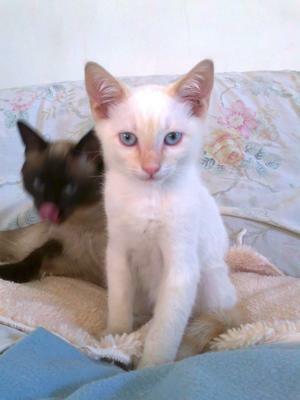 Mushito is a flame point Siamese kitten. From the moment I saw his photo posted on the Internet, I said to myself, "he is mine!" 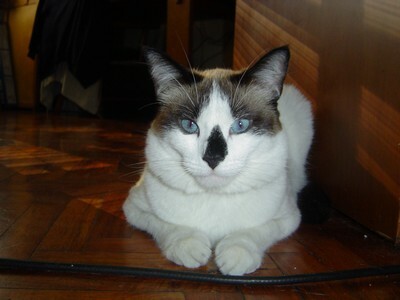 He was the companion of Whimpy, another Siamese cat, but Whimpy fell and broke his spinal cord so I had to let him go to a better life as not even an operation could have saved him. Mushito loves to run and jump, and with Whimpy they were really good pals. They would sleep together, clean each other, and what one did the other would follow. Mushito loves to play and destroys everything, especially bathroom paper. He is only six months old. 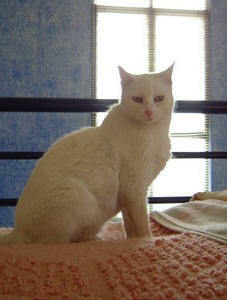 Most flame points are males; his body type is slender although he eats very well from canned food. Mushito was given to me with that name, I named Whimpy like that just because I liked the name. 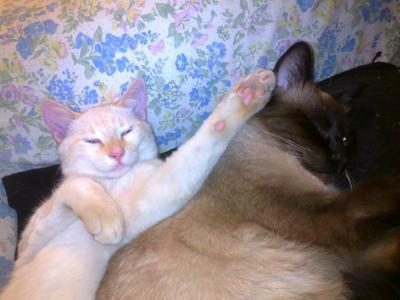 Mushito cried so much missing Whimpy, so I adopted a little female Siamese kitten called Cassy to keep him company. She was sweet, had bad moods whenever she didn't get what she wanted, and could also get mad and lash out against me and scratch me. She loved to walk around the building where I live, when I couldn't find her I would shout "Moe, Moe" and she would run from wherever she was and say "Miau Miau!" and run off again. 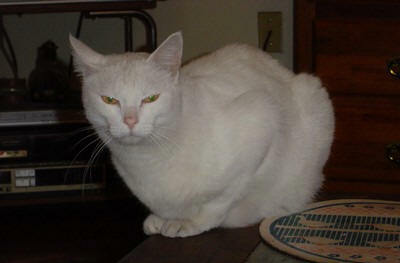 There was also Piki, a lovely all-white cat with yellow eyes who died from diabetes. And before that there was Piki's mom, Momo, who died from sadness. They were both about twelve. Here's Momo. I will always remember them and they will permanently have a place in my heart. So this is in honor of my angels, Momo, Piki, Moe and Whimpy and my present cats Mushito and Cassy. Roberta, thank you so much for sharing your memories and stories of all your cats. 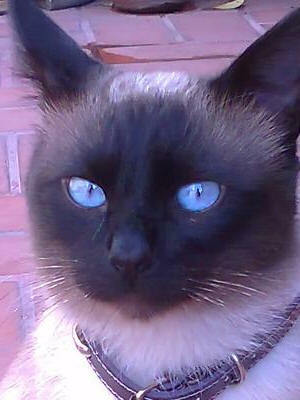 Moe was beautiful and might even have had some Siamese in her, with her blue eyes. It's so hard when the cats we've loved leave us, and it's lovely that you have Mushito, and now little Cassy to keep you and each other company. I'm sure, being Siamese, that they keep you plenty busy!